I feel like the assessment exams are like something from Ender’s Game: a test you aren’t expected to pass. How do you decide which of Selkie’s words get the ‘s’ added on? Do you have a rule of thumb or just go over each sentence and see what sounds the best? It’s a little bit of both. First and last names don’t get extra S’s, but I also speak the sentences out loud a lot of the time to see how I feel they flow with the extra S’s added on, and sometimes I dial it back a bit if I stumble too much. On the other hand, I was right about her being that blonde lady, yayz. Ender’s Game tests… heheh… please don’t have Bonzo try to kill her…. The last panel reminded me of Charlie Brown. I’m sure I’ve seen that pose before. Nice tribute and perfectly fitting with the way her day’s gone. That “AAUGH!” at the end reminded me so much of Charlie Brown. Also, Ender’s Game: darn good book, as was it’s side story, Ender’s Shadow. Oh no – the dreaded H-word! Is that “assessment at the start of the school year” thing commonplace in the US? I´ve never heard of it here in Germany. And, yes, she does sound like Charlie Brown in the last panel… with maybe a touch of Peppermint Patty thrown in. It varies by school district. Some places do, some don’t. I’ve just noticed Selkie has a pointed black tongue, among her other unusual attributes. By the way, there’s another Selkie in the classroom at Scary Go Round but that one’s a real selkie. Her tongue’s not black, it’s dark blue (like all her mucous membranes are). I don’t think it’s pointed, either… DoctorDidj, I think you’re looking at her throat. 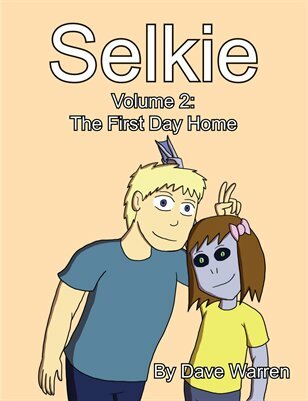 Man, I gave the mom the benefit of the doubt in the last page and then she called Selkie “creepy”! I realize some people just don’t have tact, but she’s going to have to do a lot to redeem herself in my book. Yep. Here I thought she was doing a pretty good job. Kudos to Todd for not making Selkie apologize for calling Heather a jerk. I’ve been forced to apologize for calling out bullies, and it leads to seething resentment. I wholeheartedly agree. People are entitled to their opinions, but saying that at the orphanage (especially while she was in earshot) was unacceptable and inexcusable behavior. She is a grown woman, and, as such, should know better than to fling insults, especially at a child. I almost regret urging giving her the benefit of the doubt a few pages ago, but we really didn’t have enough information at the time to make guesses about her. We don´t know the specific circumstances under which she said it, so I´m inclined to give her the benefit of doubt that she wasn´t aware Selkie was within earshot. I’m also assuming she called Selkie ‘creepy’ because 1) she found Selkie to be creepy and 2) as a bonding point for her and Heather. That is not right, nor fair for her to do that but I’m not surprised that she did. I hope she does not talk about Selkie or Tod with in ear shot of Heather once Tod and Selkie are gone. That will undo any good points she has earned in my eyes. Actually, selkie referred to this way earlier, before heather was adopted. She may have said it has an offhand comment, because people can often be callous when they’re not thinking about they’re saying. That doesn’t excuse her sayin it of course, but if she were cruel enough to make fun of someone as a bonding point, she probably wouldn’t be so angry at heather. So far, I think she handled the situation well and she’s gone up a few points in my book. I always assumed she was the blonde lady who called selkie creepy, so she already had to make up for that, but shes turning out a lot better than I thought she would. Assessment exams…for HOMEWORK? And on the first day too. Just spent the last hour or so catching up from the beginning. I love the comic. It’s cute, it’s endearing, and it’s funny. You’ve made a fan of me, and I thank you for it. I’m adding this to my favorites tab. I remember having to explain to my kid that the assessment tests weren’t tests she had to win, but were tests that would get harder and harder till she couldn’t get the answers. This was… rather difficult to explain to a perfectionist kid (with then-undiagnosed Asperger’s, which probably factors into the perfectionism somewhat). Once she grasped it, she was okay with it, but till then… Yeah, ANGST. I remember trying to understand it myself when I was younger. It absolutely sucked. Reminds me of the homework I should be doing right now. I am writing a semester’s worth of papers on the debate over these ridiculous assessments. they gotta know what ya know so they know what ya don’t know so they can teach ya what ya don’t know so ya know, ya know? It would have been a better decision to send her right back to class. Unfortunately, modern society is not satisfied until our children as traumatized as we expect them to be when something crappy happens.